It is strangely disorienting to finally hold my first copy of a book I have created. So much effort, passion, love, frustration, elation, compromise and heart have gone into every choice and decision. Years of dreaming and years of physical work. At least another year of waiting while the publishers and printers do their part. I open the envelope. There she is. My dream manifest. Alive, it has a body: corporeal, breathing, I can turn the pages, see all its beauty, all its flaws. I am thrilled and yet disoriented. The dreaming, preparing, planning, working and waiting is over. I have to compleletly change gears, change mindsets. 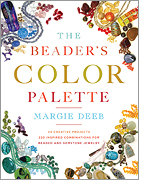 My dream is manifest: The Beader’s Color Palette is born. Now my role changes. I’m letting it go – sending it out into the world to let it do what it came to do: inspire people to find their color voice. There’s really quite a lot of angst along with the excitment and pleasurable anticipation… more than with previous books, probably because this one really has my heart and soul in it… it IS my baby. As you say, Margie, we then have to let it go.. send it out with our blessings! That is so true and made me laugh. There is always something in each book I create I just do not get along with. Its usually a small thing no one but myself would notice. Regarding letting go: I remember when I realized I no longer had every page of “The Beader’s Guide to Color” memorized. I felt like I’d lost something, even though I no longer needed to know all that – the book was print and I could look it up if necessary. I felt like a negligent mother who couldn’t remember her child’s first word or birthday. I let that guilt go as soon as I identified it. But it really startled me to have had those feelings! How intimate we become with our creations! I think that is part of making true art, that level of intimacy.